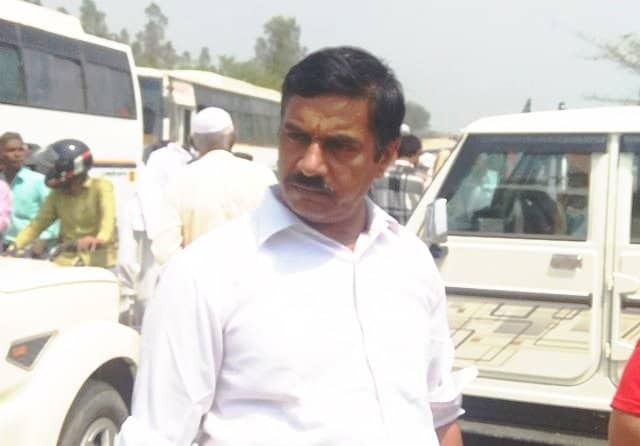 LokMarg met Satpal Sain, 52, at the BJP rally in Amroha on April 5. Sain tells LokMarg why he will remain loyal to Modi ji and contribute in any which way to see him remain seated in the Prime Minister’s chair. Pradhan Mantri Narendra Modi ji is a true leader. If he says something, he will do it. You can see that spirit in his stand on Kashmir and Pakistan. Ghus ke maara, attack ke jawab me, ek baar nahi kai baar (we entered into Pakistan territory to give them a reply in its own coin, not once but twice). Although I was always inclined toward the BJP policies on running the country, I am particularly a great fan of Modi ji. India is blessed to have a leader like him in such corrupt times. There were many people in my village who wanted to just have a glimpse of Modi ji, and I decided it was a god send opportunity for people of my village to see him in person. Yes, the heat is too much and some of those who came with me could not bear the crowd. Saans nahi aa rahi thi wahan par (it was difficult to breathe at the venue). So, after having seen Modi ji walking down from his copter, we came out. Dekh liya, bas ho gaya (I have had a glimpse of him, that is more than enough). I firmly believe that this country is safe in Modi ji’s hands and he will create more job opportunities in his next term. It takes time to overhaul the system rotting since many decades. The charge that Modi ji did not keep his word is wrong and false propaganda by opposition Congress. You expect him to cleanse the system which was poisoned over six decades. I ask you, what do you want from a prime minister? He is one man who is not afraid of wielding a broom to clean the street. This is a symbolic gesture and it sends a message to all government employees to go and work. He has given us self-respect as an Indian, as a farmer and as a Hindu. We have full faith in his word. Under his leadership, India will reach new heights. Our village youth too are his great supporters. If he had not created jobs and other skill India opportunities, do you think the youth would have supported him. Just take a look around you. There are men of all age and class all over. Such is his appeal. You have to agree to this that there is no leader today of his stature and his party will be back by another thumping win this year. l to Modi ji and contribute in any which way to see him remain seated in the Prime Minister’s chair.